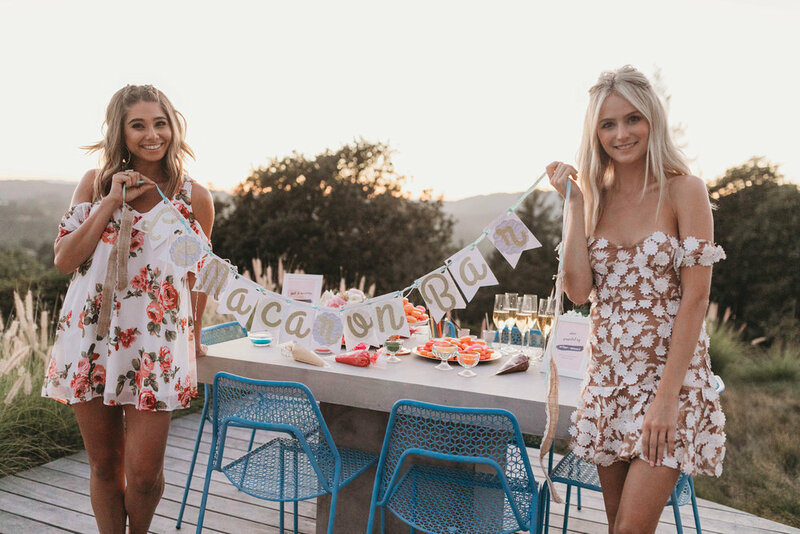 In July, I was recruited by The Stylist LA and Wine Country Colbert Group to host an intimate dinner party for some of the ladies from The Bachelor (and my new favorite blogger Everyday Pursuits...hi Ashley!) at a beautiful home in Sonoma. A lot of you had asked what I served, so I wanted to share the full menu and three of my favorite entertaining tips (cuz ya know, it ain't always easy). Hand made macaron shells with salted caramel, raspberry, and vanilla buttercream, curated sprinkles, edible metallic paint, glitter, and sugar decorations. DIY your own box. Tip #1: Hit the farmer’s market. I know this sounds cliché, but stick with me. The day before this dinner, I spent hours wandering the Ferry Building Farmer’s Market in San Francisco. When you start with really fresh, seasonal, local ingredients, you take the pressure off yourself as the chef—add a generous pinch of salt and you can get away with barely even cooking (re: the heirloom, tomato, basil salad above). But, when you start with out of season produce that’s been shipped from South America, you have to do a lot to make it taste good. I also love buying from farmers because the food comes with a built-in story, an instant conversation starter. One of the farmers sent me home with a bag full of cucumbers: lemon, Armenian, and Persian. While prepping for the dinner, I shared with one of the ladies what I had learned about the cucumbers and we did a little taste test on the kitchen island. It’s a fun way to quickly connect with your guests, especially if you’ve never before met. Tip #3: Check for dietary restrictions in advance. I often get mistaken for a restaurant on legs. Oh, you don’t like salmon? Sure, let me just butcher a chicken out back. Ah, you’re gluten free? We can remove the bread from the bruschetta and spoon feed you diced tomatoes. It can ruin the vibe. Typically, dietary restrictions aren’t flexible. And while it’s nice for a guest to let you know in advance, it often doesn’t happen, so I make a point to ask before I grocery shop. I always feel much more comfortable knowing about restrictions so I can plan around them. Making adjustments on the spot can be very tricky if not impossible. Fortunately, these ladies were a breeze and happily ate everything. If any of these dishes catch your eye let me know and I’ll write up the recipe for you!